Yesterday the candidate of APGA was caught reading from a already prepared speech at the debate organised for Anambra candidates for November 16 gubernatorial election by The Nigeria Election Debate Group. In what looks like encyclopedia ‘likely questions’ numbering about 8 pages of handwriting papers was discovered by Labour Party’s Candidate Ifeanyi Ubah of Capital Oil. 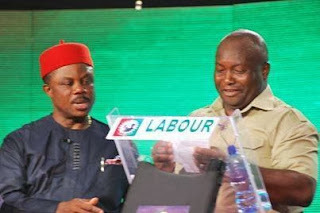 Ifeanyi Ubah had at the beginning of the debate expressed apprehension that some of his colleagues had prepared text, but the organisers overruled him, but at the tail end of the exercise, Ifeanyi who stood beside Willie couldn’t stomach the illegality playfully approached him, took the papers from him and showed the papers to audience, camera, organisers and shared some with APC’s candidate Chris Ngige Onwa haven called him, ‘Onwa see o’. A disappointed Willie was surprised and speechless, started sweating in the very cold room.